Finally another free pattern to share. This hat is for a child from 4 to 10, but can fit a little loosely on a 2 yr old and firmly up to 14. I have had it on my head and it barely fits, my head size is an adults meduim to small. The hat fits my 4 yr old grand son just perfect and was a little loose on my 2 yr old but he still looked good in it. I hope to have some pictures of them wearing the hats soon. I also used a hook 1 size smaller, same ply yarn and made the hat to fit a baby 6 to 12 months old. The hat is made with the hdc st and works up quite fast, I have included a video tutorial for the hdc st at the bottom of the page. If you make this hat, I would love to hear your feed back. 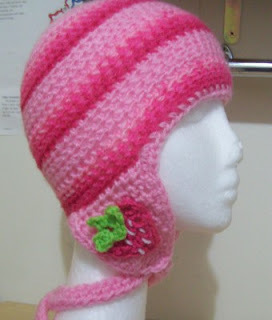 I put a small flower on each side of the pink hat and a couple of buttons on the blue hat. In the picture below I used a 4mm hook with the same pattern directions, this fits a 2 yr old. 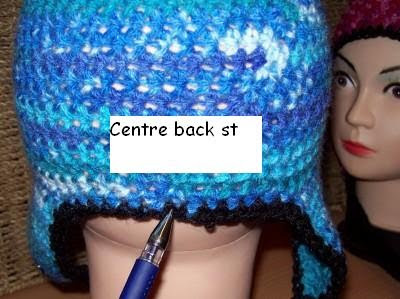 In the picture below, I am showing you what I am referring to in the pattern as the centre back st. 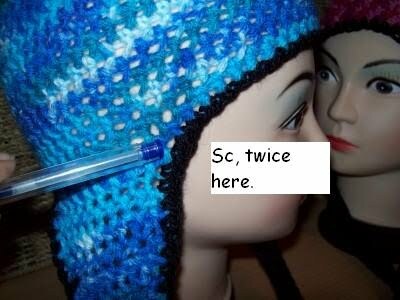 In the picture below, I am showing you where to sc twice when you make the edging for the hat. 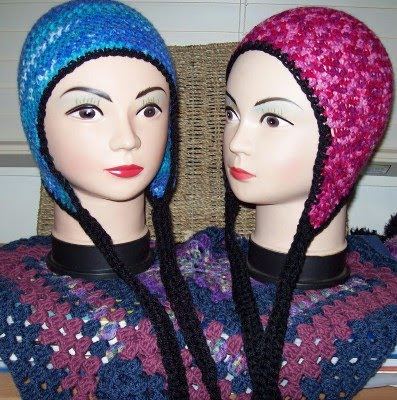 If you turn the hat inside out, you will get a knit look, as per the picture below, the hdc will only look like knit when it is made in the round such as a hat. Please see pattern tester from the US for more ply and hook sizes. 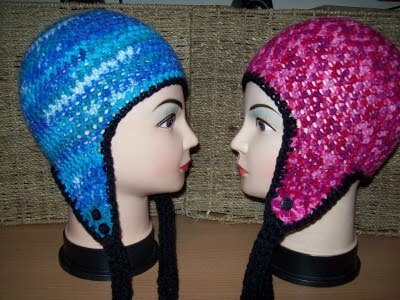 Hat begins at top of head, ear flaps attached at lower edge of hat. Medium tension used, I am neither a loose or tight crocheter. Rows: 8 to 21:, repeat row 7, finish off leaving a small tail, this will assist you with your earflap placement and can be sewn in later. Ear Flap PlacementsUsing the small tail as your centre back st, each ear flap with be placed 7 st’s away from both sides of this st.
Repeat pattern for left ear flap to make the right ear flap. Give your hat an edging and ties. At this point, sew in all loose ends. 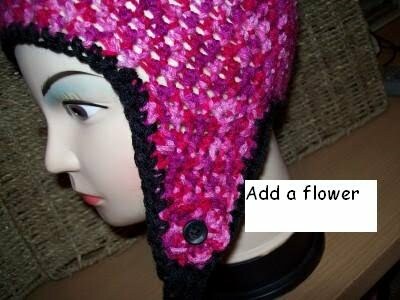 Attach yarn to any st at the back of the hat. Make 1 sc in each st and space around, placing 2 sc’s in each corner where the flaps join the hat, you will have 2 corners on each flap. Check your work as you go around to maintain evenness. I made mine 14 inches long and used a hdc foundation row stitch (see, Chainless Half Double Crochet Foundation video below), then sewed the ties on. I have also made the ties with several strands of yarn and platted them. Other options for ties is a twisted cord, length of crocheted chain, the choice is yours. Please do not hesitate to contact me with any problems you may have with this pattern. You have my permission to share this pattern, make the pattern and sell your goods, but not to sell my pattern. 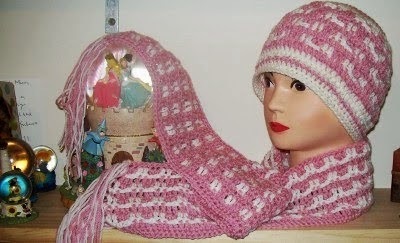 Could you link back to me if you intend to publish your hat made from this pattern. Labels: ear flap hat, free pattern, free pattern. crochet hat.